Robust front-and-back ballistic protection that goes beyond standard Level 3. The total package for front-and-back Level 3+ protection, complete and ready to go! 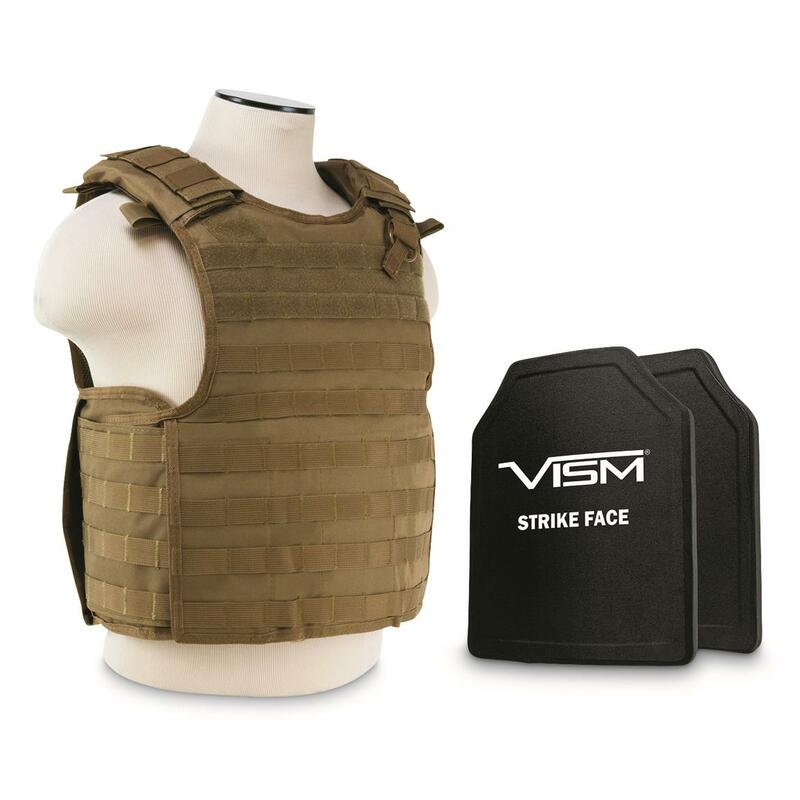 The Plate Carrier Vest ccommodates a standard SAPI plate in both the front and back pocket. A quick-release strap lets you take it off in a flash if case of an emergency. 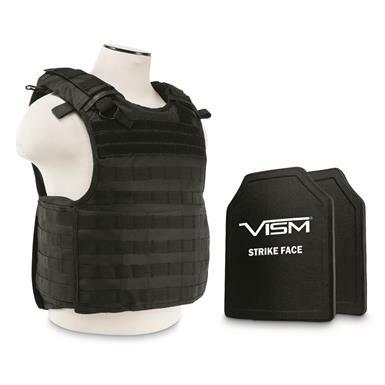 Adjustable shoulder straps and a lenght-adjustable cummerbund let you dial in your fit, and MOLLE webbing straps on the front, back, and sides let you attach a full complement of gear. 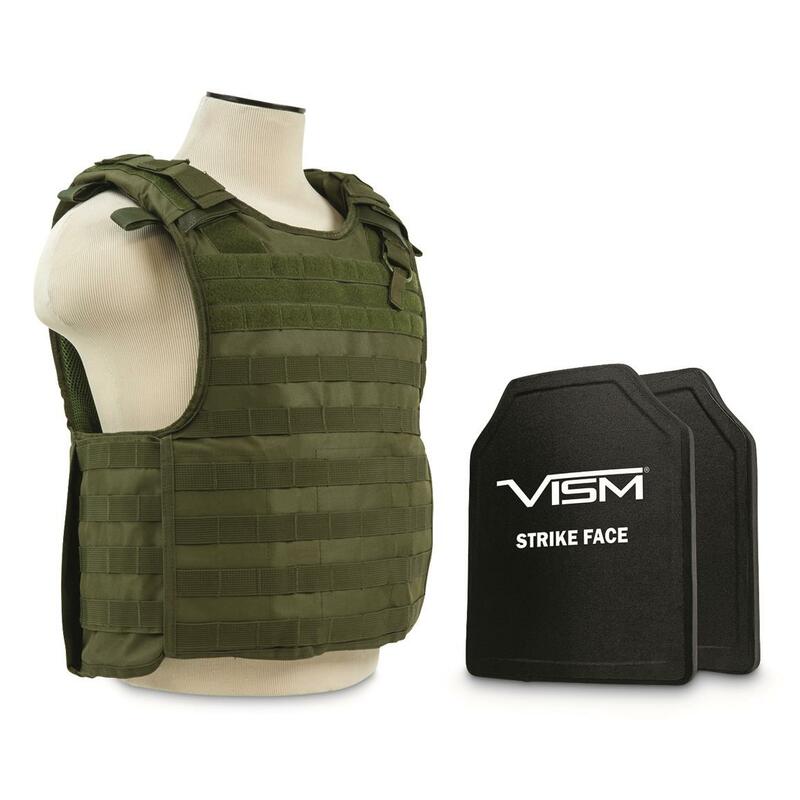 It comes complete with two Level 3+ Hard Armor Plates for robust front and back protection. Robust protection that goes beyond traditional Level 3 standards. VISM® Level 3+ Hard Armor Plates are tested to stop one round of 7.62 NATO M80 147-grain, as well as some 7.62x39mm and 5.56 NATO rounds. The Plates are made from UHMWPE (Ultra-High Molecular Weight Polyethylene), a very tough material with the highest impact strength of any thermoplastic currently produced. The special polyethylene is also incredibly lightweight—so you can wear these Plates comfortably all day. The single-curve design allows them to contour to your body, and the trimmed top corners (called the Shooters Cut) allow you to move and aim your weapon more efficiently. Adjustable-length cummerbund can be extended out to 51"
Cummerbund: Adjustable up to 51"
Armor Express H-Shock Special Threat Armor Plate, 10x12"
Turn any backpack or briefcase into a ballistic barrier. Robust N.I.J.-certified Level 4 protection from centerfire rifles and frag.